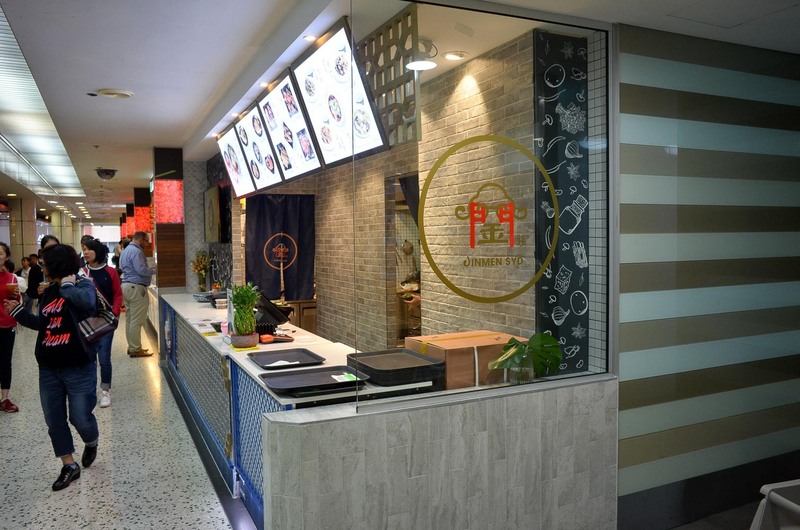 We're back in food court love with Sichuan cuisine at Sussex Centre's Jinmen. Jinmen appears in the spot of the much-missed Cafe de Relax, and some short lived copycat malatang joint afterwards. The stall looks a little fancy, it's had quite a zhooshy-up, and prices to match. Sixteen bucks for mapo tofu or kung pao chicken is pushing the food court price envelope, but folks are paying it, the stall seems to be doing ok business-wise. Food-wise we love the joint, it's unique, well cooked and generous. The boss dude tells us they are from Chengdu, or the food is anyway, which is Sichuan central. We spent a few days in Chengdu a couple of years ago and remember the food being high on spice and low on chili heat, just like it is here at Jinmen. In surrounding cities, they love some fiery chili heat, Chongqing in particular, but the thing we remember most in Chengdu was Sichuan pepper in nearly everything we ate, they are nuts on the stuff, and the Sichuan pepper tasting sweeter and fruitier than it does here. Jinmen Spicy Beef Combo Meal - $14.80. A large bowl of spicy soup, reminded us of mild Sichuan/Chongqing broths, with bamboo shoots, Chinese greens, enoki mushrooms and coriander on top. 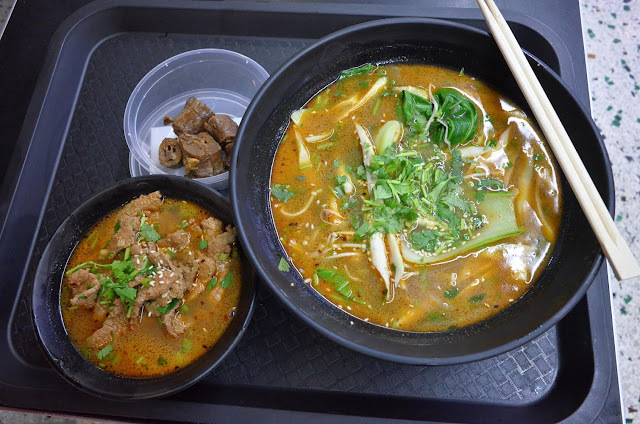 The smaller bowl has a similar broth with sliced beef. In the picture the meal came with rice, but ours came with some spicy chicken or duck necks, which suited us just fine. 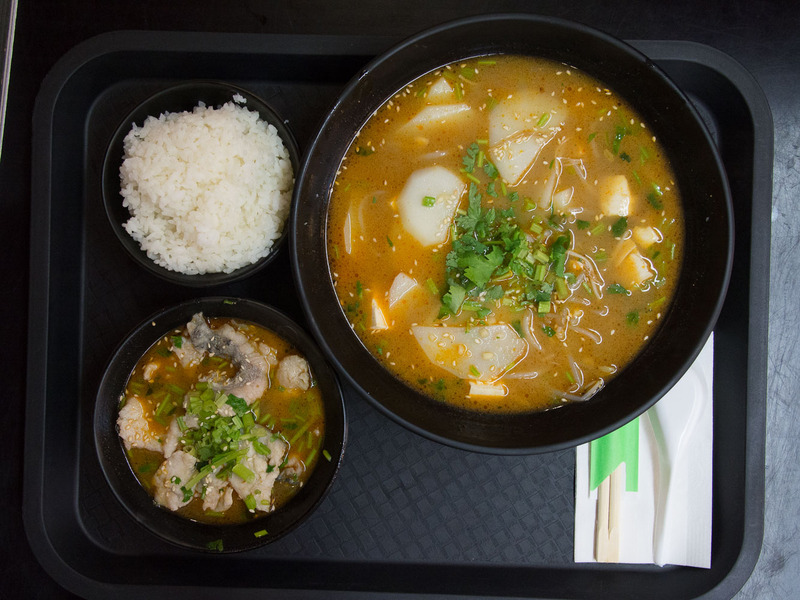 Boiled fish combo - similar to the set above, a small bowl fish and a big bowl of spicy veggie soup, with potato instead of bamboo, as well as bean sprouts and tiny cubes of tofu. It seems each combo comes with a slightly different soup. Marinated tofu - $8. Oh how we love the satisfying chompy chew of tofu knots. 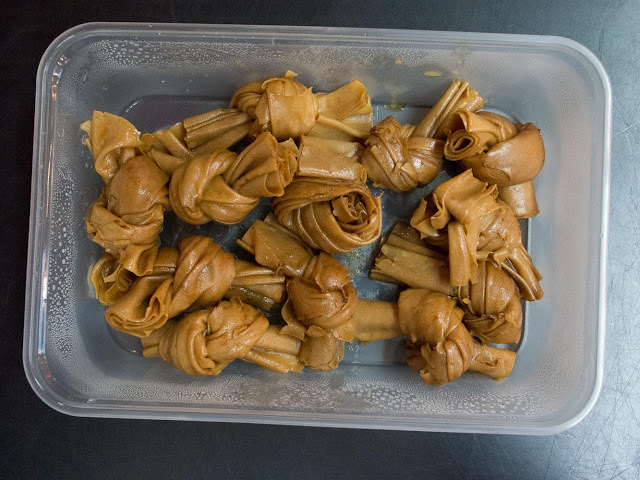 These are marinated in five spice, or something like it, and don't last long. 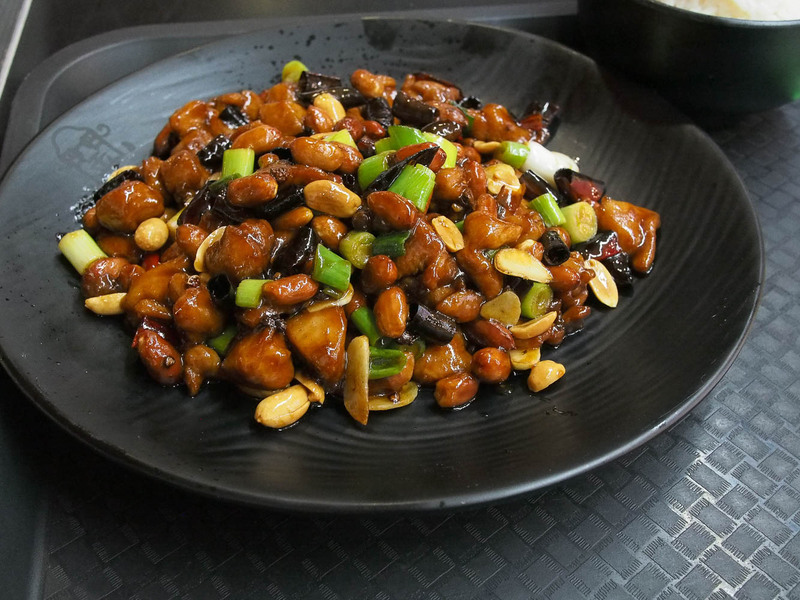 Gong bao chicken - $15.80. A classic stir fry of diced chook, peanuts, shallots and Sichuan pepper. It's mild on the chili and a touch sweet & shiny but we're in the mood for sweet & shiny today. 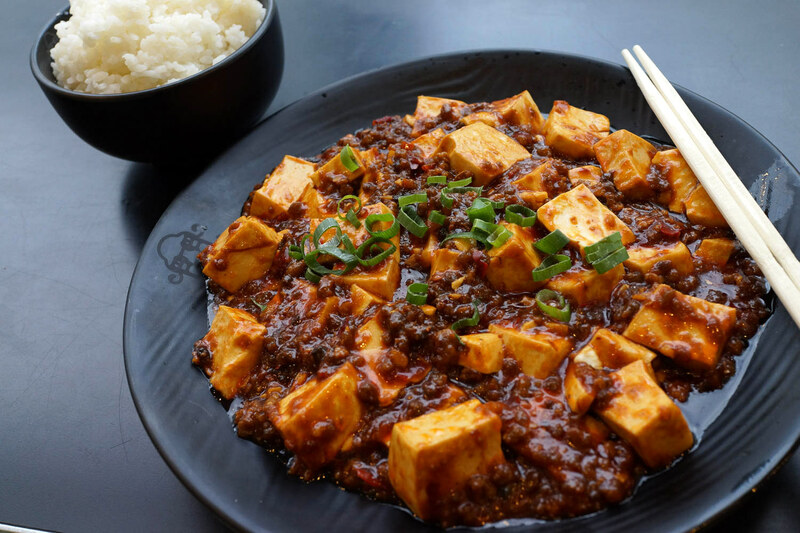 Mapo tofu - $15.80. We spent a few days randomly wandering and eating Chengdu, the home of mapu tofu, and never came across the stuff. Not a sausage. So we're pleased to find the stuff cooked by a Sichuan specialist back home, and it's s corker - a rich thick sauce pork mince sauce with a good Sichuan pepper hit, easy on the chili, a perfect partner to silken tofu. It's a little pricey but worth it we thinks, it is certainly a cut above any mapo tofu we've had in a Canto joint. 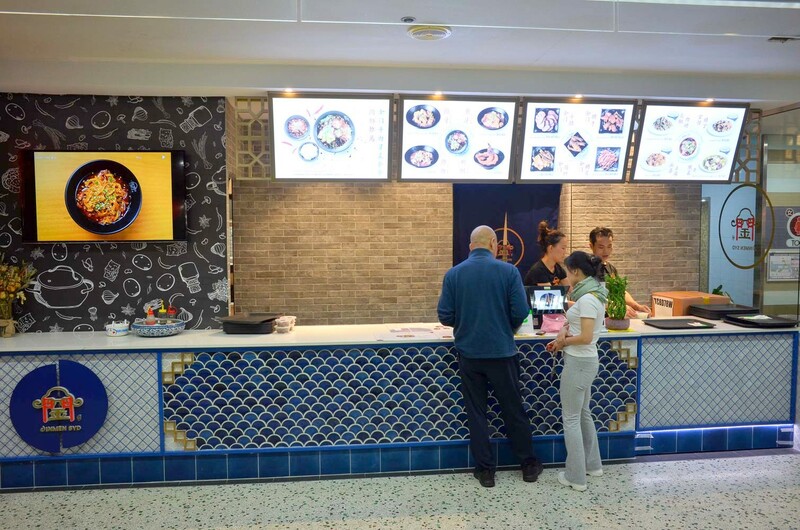 Jinmen is in the Sussex Centre Food Court - 401 Sussex Street, Chinatown, and so should you . yeah this place is great - they actually just lowered prices (as of this week), like $2 off all the combo meals. Thanks for the tip, much obliged - a wee discount makes those combos quite a good deal. I had the Mapo Tofu today and yeah it's $12.80 now. It was solid, thanks for sharing! I was happy to see black beans and could taste sichuan peppercorns in the sauce. But it was missing some extra extra depth that I experienced in Chengdu. But still, very satisfied. Getting that extra depth is always a challenge, I think sometimes there's a reluctance to cook to the same taste as 'home'.